That's what I decided to call my new pattern. I hope you like it. I would say this is an intermediate to advanced pattern because of the loop-tatted rings and because of some of the joins. But as I said in the previous post, it's all really a matter of a bit of practice and I'm sure most tatters would get the hang of LTRs pretty quickly. I will have to amend my LTR video to show that I now hardly ever finger-tat but instead I slip a post shuttle onto the loop and use it to make the stitches instead of finger-tatting: much quicker! I made it again as I was testing the pattern, in blue this time. I need to get more bugle beads really - I had some silver ones somewhere but I can't find them. I think it would look nice with silver. I added a couple of extra stitches to the LTRs as mentioned in the previous post and I prefer it that way. The pattern is now written up... I'm just debating whether I should have it test-tatted but I know everyone is so busy at this time of year so I don't dare ask anyone as I'd like to have it done NOW! Here I go again with my impatience. Anyone keen? Only one or two at most would be fab. I'd have to agree, they look great with longer picots. And one last thing: the tiny latch hook I mentioned in the last post - I was so pleased that I ordered a second one, but it's not the same! 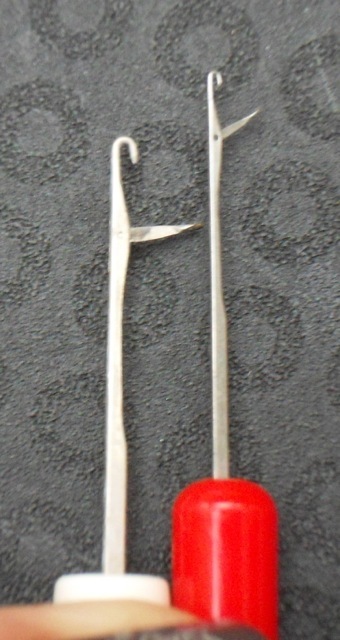 Be careful, there are different sizes in these tiny hooks and the new one I bought is bigger than the one with the yellow cap and does not fit through bugle beads. The yellow and red one says Inox 4/0 on the cap. I'll have a search to see if I can locate one. Hope to have "Ice Queen" ready really soon. Keep an eye out if you are interested in trying your hand at this challenging pattern. Oh, and I nearly forgot why I particularly wanted to do a blogpost today: it's the 12th day of the 12th month in 2012. Special day, think you not? And there won't be another matching date like this for 89 years! So make the most of this one! Very good choice of a name for the snowflake. Your designs and tatting are always perfect in my mind. Thank you so much Jon, that means a lot! Very pretty. When it comes to designing you have a devious brain, Frivole!!!! I love it. IF you still need a test tatter I could give it a whirl this evening. Yes please! Thank you Jane. Love the pattern. I'm available for test tatting if you still need one. Thank you Karen! I'm sending it very soon. I'm ok for test-tatters now, thank you! I think you've struck a beautiful balance between teh beads and the tatting. I've been incorporating more bugle beads into my tatting too - they're a nice contrast when you otherwise have a lot of chains, both for the shine and for the visual contrast of a straight line amongst the curves. Thank you Jesslin, I like your comment and agree with you that it's nice to have the contrast of the "angularity" of bugle beads amongst the curves of tatting. Such a beautiful snowflake! I hope the pattern is ready soon, I sure want to test it! It is absolutely stunning! Wow! Very beautiful snowflakes. I admire the ability. Only just read your blog! I also wanted to blog this special day. 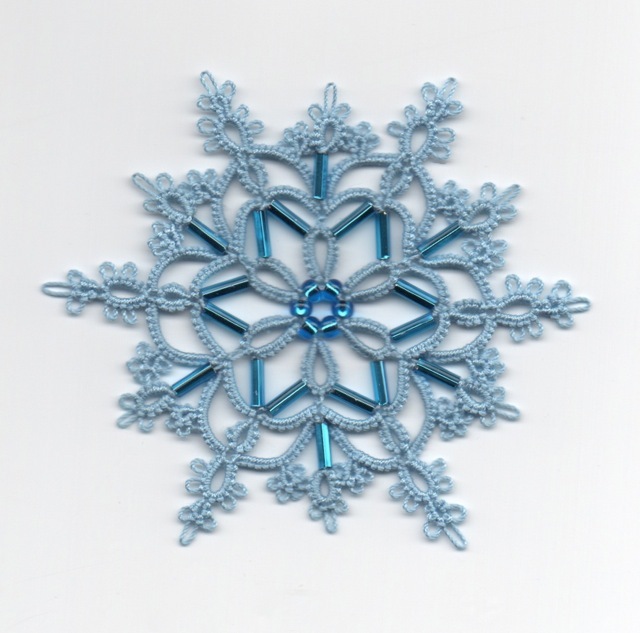 The snowflake is really stunnning, or have I said that before?!! I have silver bugle beads shall I send some to you?!! Thank you Sally! That's so kind. I know I've got some somewhere - makes me mad when things disappear like that! I'll have another search but if I can't find them, I may take you up on your offer! This final version is gorgeous! I love it, and can't wait to test my skill at LTR. The snowflakes that Shannon tatted are really very nice, especially the pink one. It looks like a real snowflake in that shape. very very beautiful ornament!!!!! Compliments!! I'm kind of spechless here! 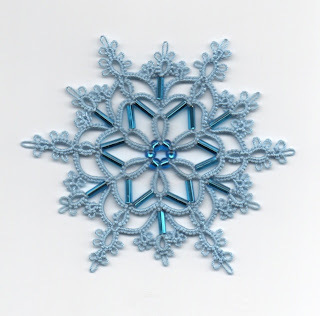 You have truly captured the look of a perfectly formed natural crystal snowflake! I'm also amazed at the speed that you wrote the draft, found test tatters and produced the final pattern! This is a marvelous electronic age! Thanks also for the info about the hook. I want to make sure I get the right one when I order it! I can't imagine how tiny it must be get through a bugle bead!! What About This One?... and Wonder Tool!